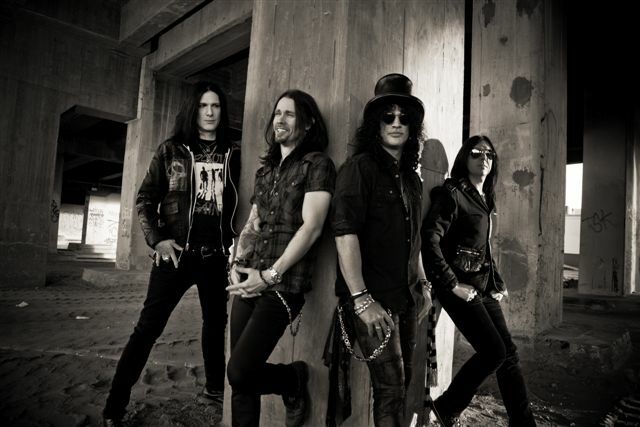 SLASH (VELVET REVOLVER, ex-GUNS N' ROSES) is currently in a Los Angeles studio working on his new album with Myles Kennedy and The Conspirators. It will be released on Slash's own label, Dik Hayd International, distributed through EMI in the US and Universal Music in Canada. For the new album, Slash - along with and his bandmates Myles Kennedy (vocals), Brent Fitz (drums) and Todd Kerns (bass) - have teamed with producer Eric Valentine, who also produced the Slash disc. All the songs were written together by Slash and Kennedy, and cameras have been rolling throughout the entire making of the album.